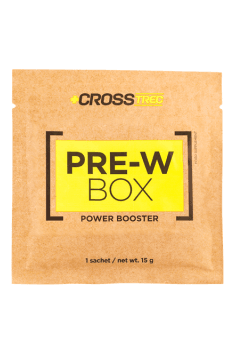 PRE-W BOX CrossTrec a pre-workout supplement forming part of the of the innovative line CrossTrec, designed for people who prefer intensive functional training, including high-performance athletes. It guarantees a unique and long-term stimulation of the pump, thus is intended for use against the most intense workouts or competition. Significantly increases the strength. 1 sachet (dissolved in 300 ml of water) per day, approx. 30 minutes before a workout. Due to the caffeine contained in the product, do not use in the evening. Product prepared as a pre-workout support, it's advisable to use only on workout days. It adds energy for an intense workout. Very convenient form for use - easily soluble powder in a perfectly measured dose. Should be dissolved in approximately 300ml of water and drunk approximately 30 minutes before workout. Guarantees muscle pump, greater strength and maximum stimulation. Note - contains caffeine. I don't recommend using it in the evening (might cause problems with falling asleep), and do not combine with other products containing caffeine. Supplement designed primarily for athletes as a pre-workout stimulant and before competition, it seems to me that it's worth leaving it for a workout days. Using it without taking a break can increase the body's tolerance to the active substances contained in the product and it might slowly lose its effects overtime. CROSSTREC - The brand created for all fans of CrossFit. In addition to the dedicated line of supplements, it is also a collection of video tutorials, tips and competition highlights that are designed to help them in training. Maltodextrin, anti-cake agent- silicon dioxide, acidity regulator- citric acid, flavors, thickners (celullose gum, xanthan gum), sweeteners (sucralose, sodium saccharin, sodium cyclamate), color - azorubine.